From our friends at Minnesota Power. Thanks for sharing! The three chicks at Hibbard Renewable Energy Center now have names as well as leg bands. The youngsters, two females and a male, are Spike, Jolt and Surge. The Hibbard falcon names were dreamed up by Jodi Piekarski, supervisor, generation production at Boswell. She submitted the names Spike, Jolt and Surge, and employees selected the three as winners in a Powergram online contest that attracted a total of 170 electronic votes. The votes were tallied today, the same day that Bob Anderson and Amy Ries of the Raptor Resource Project were in town to band the chicks born about four weeks ago. Earlier in the day, they also banded the chick born at Greysolon Plaza in downtown Duluth. 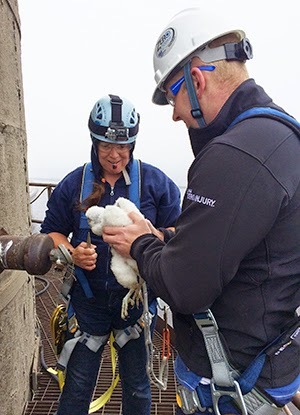 Ries, along with Minnesota Power employees Doug Braff and Matt Pohl, climbed the stack at Hibbard as the youngsters’ parents circled and screeched in alarm and news crews from WDIO, KBJR and Fox television stations watched from the roof and documented the climbers’ progress. The nesting box is on a platform on the stack about 200 feet above the ground. It was a climb that only a short while earlier was in jeopardy. The MP safety crew—John Hollingsworth, Ian Wenzel and Dan Belluzzo—were checking weather conditions and monitoring lightning strikes. Fortunately, a storm that had been moving closer to Hibbard dissipated and banders were given the go-ahead. One egg at Hibbard and the four eggs at Boswell Energy Center failed to hatch this spring, and Anderson attributes that to cold temperatures at a critical time. It was a theme the Raptor Resource Project, based in Decorah, Iowa, has seen play out at many falcon nests in the Midwest this year. Still, even with no luck this year, Boswell is one of the most productive of the Midwest power plant sites, he said. 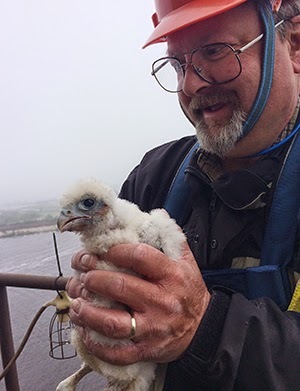 More than 60 peregrine chicks have hatched at Boswell since 1993 and 15 chicks have been banded at Hibbard since 2008. Piekarski’s names received 73 of the votes cast by employees, or 42.9 percent of the ballots. Finishing second in the voting was the trio of Louie, Copper and Ace. The names Aspen, Spruce and Birch finished third in the voting. Breezzy, Chillee and Bhurrrrr captured fourth place (and last in spelling). For her winning entry, Powergram will present Piekarski with a beautiful 8-by-10-inch peregrine falcon print.